I know I haven’t posted many food photos. Actually, I’m not sure if I’ve actually gotten to that leg of my adventures. Don’t worry, it’s coming. Anyway, I was rather impressed with myself tonight, so I thought I’d share with you what I made for dinner. 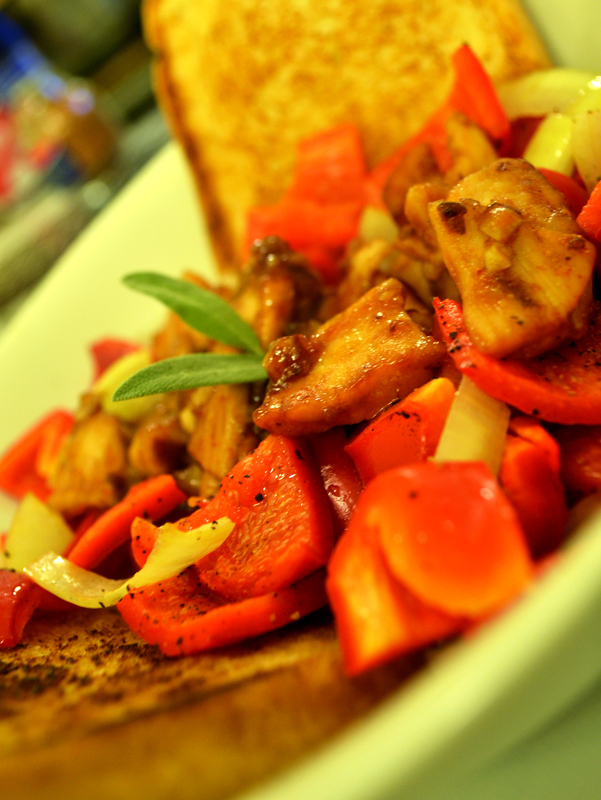 Sticky plum chicken with roasted onions and red peppers, bordered by two buttered slices of toast! A cinch to make, and it tasted fantastic! Delicious dinner, indeed. Is your mouth watering? Yes, my mouth is watering…care to share the recipe? I’m all for easy to prepare and tasting great. Definitely! I found the recipe on one of my favorite sites, called SortedFood, and tweaked it a little to suit what I had in my cabinets. I’ll send you my version via Rachel but this is the source recipe, plus video! I should have taken a picture of my lunch for today, but I made it in the morning before I had to leave at 6:50am to catch the ferry, so I didn’t have time. BUT, it was delicious. Lemon-marinated chicken roasted in the oven with salt, pepper, and thyme. Then drenched it in honey and let it cook until the skin was nice and crispy…SO GOOD. Found a similar recipe online somewhere and then tweaked it to suit my ingredients/kitchen/eating restrictions, but I can’t remember where….